The following are the most asked questions we get on our Superferry Promo Page in Facebook. 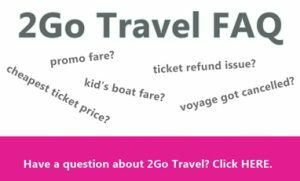 We thought to compile the answers to your usual queries about the rules and policies when travelling with 2Go Travel 2019 . Do place it in the comment sections if you have other questions on booking of tickets and actual boarding so we can help answer these queries. How much is the Superferry ticket price? How do I buy my Superferry ticket? You can visit any of the 2Go ticket outlets or contact Superferry at (02) 528-7000. The most convenient way though is through online booking. If you do not know how to book online, click this GUIDE. How do I know if there is an ongoing 2Go Travel Promo Fare right now? Most Superferry promo fares are announced a day before or during a Major Holiday or Special Event in the Philippines. Whenever a new 2Go Travel 2017 promo is announced – we will share this on our Facebook Page. Hence, don’t forget to FOLLOW us because if ever there is an ongoing offer, the allowed booking period to get promo tickets is often ONLY a day – that day we make the post and it may be too late for you to get cheap tickets if you read the post days after because you failed to FOLLOW us on FB. When I visit the 2Go Ticketing Outlets about the announced ship promo fare, I am advised there is actually no promo, why is that? Most promo fares are only online on the SuperFerry website or by calling the 2Go Hotline. Often, NO ticketing agency participates in them. 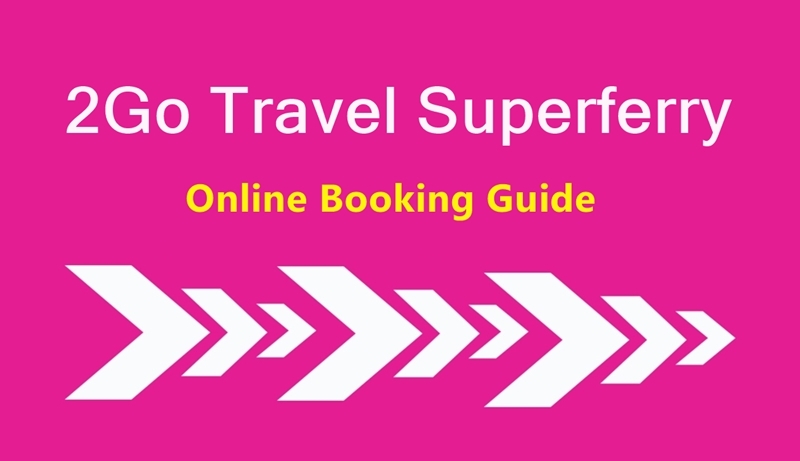 Learn how to do the Online Booking for Superferry so you won’t miss out on the upcoming 2Go ticket promos – check the 2Go GUIDE link above. What are the Superferry ports/destinations? Where do the 2Go vessels travel to? Does 2GO sail to Davao, Surigao, Bohol, Leyte, etc? How long is the Superferry voyage? When will the 2Go Ship arrive at its port of destination? How much is the boat fare for minors or children? 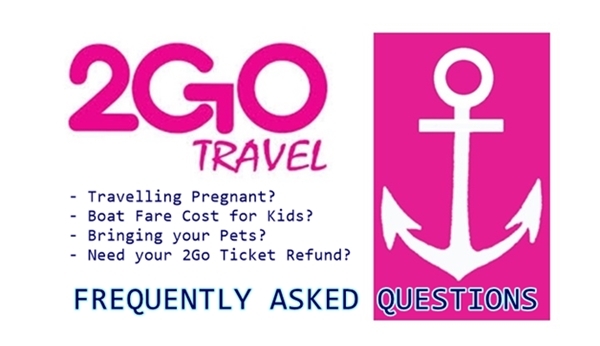 The 2Go Travel Ferry rate for Children 3-11 years old is the same as the regular fare. A Student Discount may be given – 15% off the regular fare for Economy and Tourist accommodations only. Valid ID must be presented during ticket purchase and boarding the ferry. Those below 3 years old are considered Infants and are charged P205/head at the terminal. Are meals included with the cost of my 2Go ticket? Yes, number of meals are included with ticket purchase but varies according to schedule. How much is the 2Go Travel baggage allowance? Each paying passenger of 2GO Superferry gets 75-kilo baggage allowance, each baggage should have dimensions no more than 20 inches x 30 inches per piece. Baggage must fit into the passenger’s accommodation area and should not obstruct passageways. It is recommended to tag each baggage with owner’s name and address. 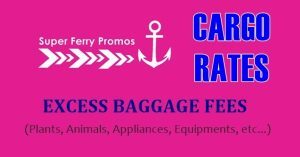 Read on 2Go Superferry Cargo Excess Baggage HERE. What do I do for cancelled 2Go Travel trips? In case the 2Go vessel cannot continue or complete the voyage, Superferry reserves the right to cancel the ticket and refund the passenger the unused cost of said ticket or revalidate for another schedule or destination. If you are not sure if your trip was cancelled or will push through, you may contact Superferry for cancelled or on hold trips to be guided accordingly – the 2Go Hotline is (02) 528-7000. How can I get a refund of my Superferry ticket? 2Go ticket refund requests can only be accepted at the Corporate Office provided the passenger can present the complete set of unused ticket with no alterations and necessary identification. Surcharges are applicable. A NO SHOW FEE will be charged for Superferry tickets refunded after the vessel departure. What if I want to bring my pets (alagang hayop)? Is there a fee to bring pets aboard 2Go Travel Superferry? Bringing of pets and other animals are allowed on the vessel provided that they are properly caged and with quarantine certificates from the bureau of Animal industry and a bill of landing (BOL). They would also be placed on a separate area in the vessel. Owners are allowed to visit and feed their pets. You can settle the quarantine certificate and the BOL at the Pier on your actual departure date. The cost depends on the size of the cage where minimum fee is PhP 150.00 per cage. 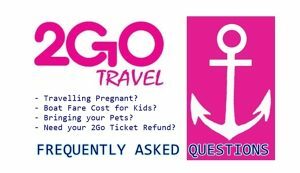 Can I board the 2Go Travel ship even if I am pregnant (buntis) ? Pregnant passengers more than 28 weeks or 7 months pregnant may be denied passage on the vessel. 2Go travellers who are less than 7 months pregnant must execute a waiver and a medical certificate attesting to her fitness to undertake the voyage. What if I want to bring my car or motorcycle onboard the 2Go ship? You can contact 2Go Freight for trucks, cars, motorcycles and other vehicles for transport. The contact number is – (+632) 528-7400 or you can email them at 2GO_Freight@2GO.com.ph. What time should I be at the pier for the Superferry check-in and boarding? Be at the terminal 4 hours prior to departure. Hope this was of help! Note that 2Go Travel may change their policies at anytime. We will be updating this FAQ from time to time to make sure we give you the most accurate and latest information about travelling with 2Go Travel Superferry. We will be on the lookout for the latest Superferry Promos this 2019 to 2020 especially the 5 pesos 2Go Travel crazy sale so make sure you FOLLOW our Facebook Page so you will get the notification on your newsfeed. IS THERE A PROMO FARE GOING TO MANILA THIS APRIL? my promo po ba this month of july ? ?mgkanu po ba fare ngayon july 27 pa po aku mgkuha nang ticket. mgkano po ba?